Add a good pinch of chilli powder to give this curry an extra kick. You can swap the cauliflower rice for wholegrain rice or flatbread, if you prefer. 1. Heat 1⁄4 tbsp oil in a large frying pan over a medium heat and add the onion, garlic and ginger; season and fry for 8 minutes, until softened and starting to caramelise. Add the tomato purée and curry powder and fry for another 2 minutes, then tip in the tomatoes and coconut milk and simmer for 10 minutes more, until reduced. 2. Meanwhile, pulse the cauliflower in a food processor in short bursts to rice- sized grains. Heat the remaining 11⁄4 tbsp oil in another large frying pan until smoking hot, add the cauliflower, season and fry over a high heat for 5 minutes. 3. Add the prawns to the curry sauce and simmer for 3-4 minutes, until pink and cooked through; season with salt, plus the lime zest and juice. 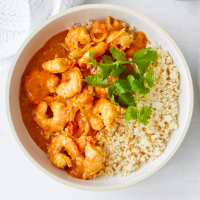 Serve the prawn curry with the cauli rice, scattered with the coriander leaves.